Son of the chief of Hy Murray, he was taken as a hostage when he was ten years old, released at age twelve to the Bishop of Glendalough where he was educated at the monastic school. He became a Monk and then Abbot. 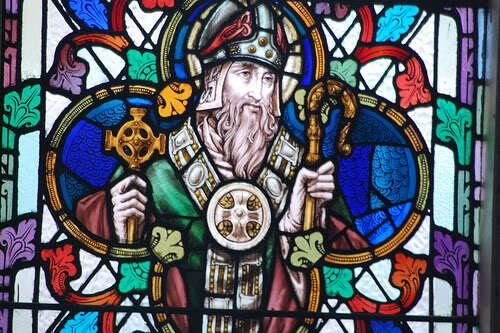 He became the first native-born Irishman to become the Archbishop of Dublin. He was noted for his personal austerity, he wore a hair shirt under his ecclesiastical robes, made an annual 40 day retreat in St Kevin’s cave, he never ate meat, he fasted every Friday, and he never drank wine. Apparently, he would colour his water to make it look like wine and not bring attention to himself at table. In 1171 he travelled to Canterbury on diocesan business. While preparing for Mass there he was attacked by a lunatic who wanted to make Lawrence another St Thomas Beckett. Everyone in the church thought Lawrence had been killed by the severe blow to the head. Instead he asked for water, blessed it, and washed the wound; the bleeding stopped. He died while travelling with King Henry II, travelling as a peacemaker. It resulted in his imprisonment and ill-treatment by the king who decided he had had his fill of meddling priests.